Current middleweight champ Chris Weidman knows it’ll be the end of the world if Aldo loses. Again, however, Aldo is Aldo and his camp is no short supply of support personnel. To take things up another notch, Aldo’s squad hired Jonas Bilharinho to spar with Aldo ahead of the fight, as the Jungle Fight star’s style is the closest thing to McGregor’s. Brazilian portal Combate.com interviewed the man, and we’ve translated some of it for you to get a glimpse into Aldo’s camp, how Bilharinho is helping and what he thinks McGregor will bring on July 11th. McGregor has a lot of power in his striking. His isolated strikes are really good. He puts a lot of energy into each of his strikes and has a very strong mental game. I talk a lot during sparring, and there’s some people who aren’t hip to what I’m doing and think I’m just clowning, cursing at their champion but I’m not having any of it. If we’re going to mimic, we mimic everything. I curse at him in English even. If he understands or not is no problem. There was a funny situation with Aldo. He kicked my inner thigh and he got me good. It’s very likely that McGregor will dismiss Aldo’s good hits to break him mentally, which I don’t think will work, but we have to simulate it here as close to the real battle as possible. So he struck me good, and I said, “You got nothing, Aldo” He turned around and said, “Oh, my bad, did I get you in the nuts?” Then I got serious, kept looking at him, he shook his head and remembered what was happening. After the session we laughed a lot. I think Aldo has the advantage. McGregor moves forth too much and has a lot of trouble striking when being struck. He’s a counter-striker who comes and goes on his own time. 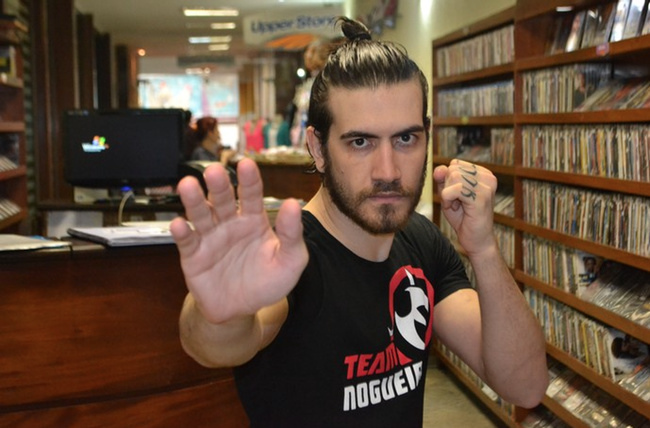 He does it really quickly, to his merit, but he can’t exchange with a guy who’s striking at the same time as him, remember Diego Brandão, who was the only one who got inside of [McGregor] and the only person to put him against the fence. I think that’s the way. I find it unlikely that he’ll be able to come at Aldo. It’s not something someone who’s training with him should be talking about, but each session he takes steps forward, and I notice the difference in each session. He’s correct a lot of things he promised he would correct and it’s impressive how quickly he absorbs the aspects of the game we’re trying to impart. And another thing, he’s got great listening. It’s like a video game. If someone who’s outside says, “Aldo, I want a knee,” he throws it immediately and it connects. He’s a good listener.